Combine the biscuits and butter and press into a 20cm lined cake tin (if using a springform cake tin, wrap in foil to prevent water from entering during baking). Blend the cheese, crème fraîche, sugar, flour, eggs, white chocolate, cardamom and zest together until smooth and pour into the crust. Bake in a bain-marie at 100°C until just set with a slight wobble in the middle. 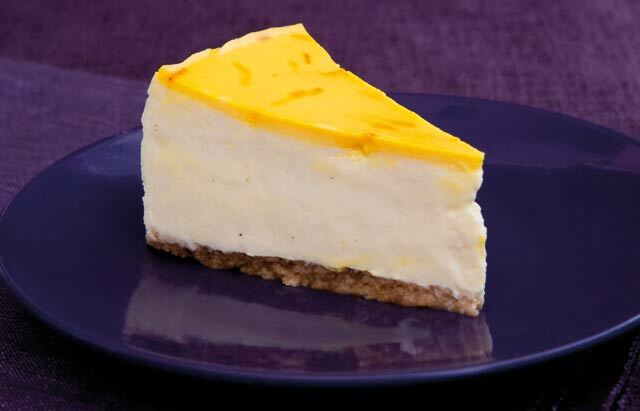 Combine the sour cream, sugar and saffron water and carefully spread over the cheesecake. Bake for additional 10 minutes. Turn off the oven and allow to cool completely then refrigerate until set. As the most expensive spice in the world Saffron literally worth its weight in gold!. Saffron is made up of the dried stigmas of the purple crocus flower with each bloom yielding only three delicate saffron strands. We celebrate the saffron harvest – which takes place this month – with a pinch or two. After all, a little goes a long way!